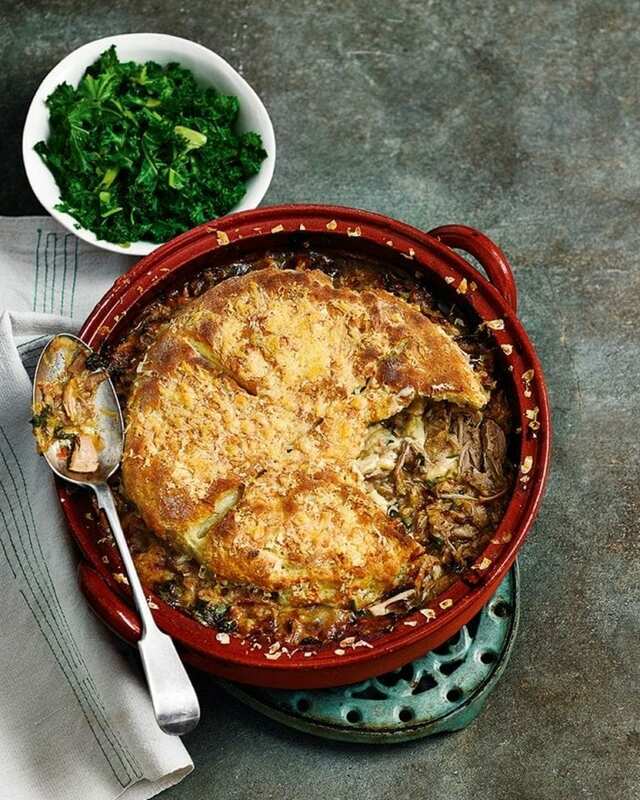 A cheesy scone-like topping and slow-cooked pork filling, made with leeks and cider, will have your guests coming back for seconds. Heat 3 tbsp olive oil in a large shallow casserole (about 30cm). Season the pork, then coat in the seasoned flour and add to the hot oil. Brown well all over, then remove to a plate with a slotted spoon (you may have to fry in batches). Add the leeks and pancetta to the pan, with a little more oil if necessary, and fry gently for 10 minutes until soft. Add the sage and return the pork to the pan. Add the cider and stock, covering the pork, season again and bring to the boil. Reduce to a simmer and cook, covered, for 1 hour. Remove the lid and simmer for another hour until the pork is tender enough to pull apart with 2 forks. Break up the pork a bit, stir in the chopped parsley, then leave to cool a little while you make the topping. Heat the oven to 200°C/180°C fan/gas 6. For the topping, put the flour, mustard powder, baking powder and salt into a large mixing bowl and stir to combine. Add the butter then, using your fingertips, rub in the butter until you get a coarse, sandy mixture. Stir in the buttermilk and bring everything together into a soft, sticky dough. Shape the dough into a disc slightly smaller than the casserole, using a little extra flour if it’s too sticky, then score a cross in the top using a sharp knife. Scatter half the grated cheese over the pork and place the cobbler disc on top. Glaze the top with the reserved buttermilk, then scatter over the rest of the cheese and bake for 40 minutes or until the topping is golden and cooked through. Leave to stand for 5 minutes before serving. Cook the pork up to 2 days ahead to the end of step 2, then cool and chill, covered. Heat on the hob before topping with the cobbler. Or, once cool, freeze the pork in a freezerproof container for up to 3 months, then defrost and warm through before continuing.